The wiring box is used for the Perfusion Monitor Software. The configuration is constantly changing as more capabilities are added. 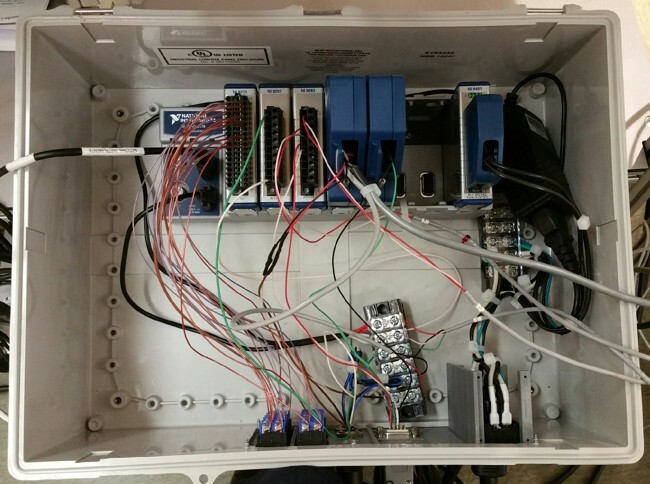 Initially, it's common to hardwire a new device, but hardwiring is only acceptable in the prototyping stage. As quickly as possible, it's converted to a front panel jack. This allows devices to be plugged into alternate ports or swapped out for troubleshooting. It also allows the entire box to be removed for servicing or for use in another environment such as a vehicle. The box itself is a BUD Industries NBB-15247 enclosure, approximately 15 x 11 x 7. The lid is currently removed, although there is room for it to be put back in place if needed. Rubber feet were screwed onto the bottom. The NI chassis is bolted through the bottom of the box. The front panel is 3D printed. This allows it to be easily reprinted anytime a new port is added. Extra holes are frequently included for possible future ports. To accomodate the panel, a hole was cut in the box, slightly smaller than the panel. 1. Hardwired 12V power supply to the NI Chassis. 2. Hardwired 6V power supply for the pressure transducers. 3. A/C Power to LN2 solenoids via the relay module. The high voltage is all kept over on the right side of the box. All connections are strong and the wires are well anchored in case they come loose. A larger divider is planned in order to better isolate the high voltage side. It's also planned to move high voltage relays out of the box and into separate enclosures, such as the Chiller. Uses a flathead screwdriver with spring terminal that is technique sensitive and requires training. 1200 samples per second, 140 ms per single sample when set to TimingMode=HighSpeed. Might move to a strip longer than six, oriented horizontally so that it's all one unit. To wire the box, cut a 12" piece of TC wire, remove the two wires from the outer sheath, and then remove the insulation on both ends of the wires. Wiring to the screws on the panel jacks takes time. Each wire must be twisted and must wrap tightly around the screw. The wire and plug on most thermocouples is long enough to reach the box. If not, we have on hand a variety of lengths of extension cords, assembled in house. Pressure Transducers describes the pin connections for the female RJ-11 panel jacks. The hardwired 6V power supply provides the excitation voltage and is hooked up on the terminal block. We may later move to alternate wiring that takes advantage of the Vsup pins to eliminate the terminal block. Refractometers page describes the pin connections for the male panel jacks. Scales page describes the electrical connections used for the reservoir scale. Pumps page describes the pin connections for the male panel jacks. 1:Black out to A/C outlet below power supply. Solenoid plugs into this outlet using standard A/C plug. Was used for the old ColeParmer Pressure Transducers, but not good enough resolution for medical mV pressure transducers, so currently unused. Used by Alcor. OC uses the NI 9203 in the Patient Care Vault, and the NI 9207 in the Perfusion Monitor. 0-A0: Red + for scale 0. 1-A1: Red + for scale 1. 9-COM: All black wires connect to this single pin. If there are more than about 2 connections, a terminal block will be needed. Also used by Alcor instead of NI 9213. Potentially for withdrawal Pump reversal, switches, lights, solenoids, alarms, communication with other hardware, etc. Internal 5V excitation is provided.